* Fast and easy - cleans and polishes in one operation. 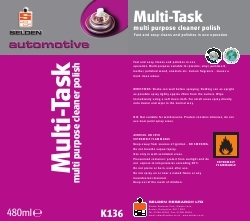 * Multi-purpose — suitable for plastics, vinyl, paintwork, leather, polished wood, enamels etc. * Lemon fragrance — leaves a fresh clean odour.